Despite becoming nationwide fifteen years ago, the home of the AFL remains in Melbourne, and always will. With ten Victorian teams to choose from, characteristics of a person are often decided by the team they support, such is the importance of the game to residents. The greatest aspect about this, is that between March and October at least three games are played in Melbourne every weekend, and as the season reaches its pinnacle, the sport overtakes the state. A day at the football is like no ordinary sporting event. Fanatical crowds roar so loud the stadiums vibrate, emotion is high from start to finish and balls pelt into the stands often, though the glory is in the sport itself. Constant excitement is hard to come across, yet is professionally achieved. Goals are kicked from astonishing distances and impossible angles, men soar atop one another to challenge for a mark or contest, and tackles are so brutal that no game is free of blood and soreness, sweat and tears. Players give everything they have for the colours they wear, and to watch them do so is inspiring and engrossing. 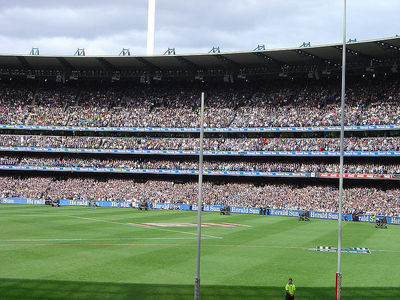 Melbourne's matches are played at either Etihad Stadium or the Melbourne Cricket Ground (MCG). The latter is one of the most recognisable sporting arenas in the world, having hosted everything from World Cup qualifiers to the Olympics. One hundred thousand people can be seated in the Melbourne Cricket Ground, and when finals arrive it is hard to spot an unoccupied seat. Etihad Stadium is smaller in size, having the capacity for only half the people, but is loved for other reasons: having a roof, and being closer to the play. Sound and warmth is captured inside this awe-inspiring environment, a battle taking place before your very eyes on each occasion. Supporting a team enhances the emotion, but a weekend spent in two of Melbourne's most iconic structures remains popular, and attracts tens of thousands every time a ball is bounced. For the price and length of a movie, with similar food and beverages available, people can be swept up by the sheer excitement and beauty of Australian Rules Football between Friday night and Sunday afternoon, assured of satisfaction. With the season heating up, there is no better time to begin your entry into a much loved aspect of our great nation. When the final siren sounds, and the winning team demonstrates jubilation, backed by the crowd and the booming theme song, the only concerning factor is deciding when to attend your next game. For more information on the AFL, please see the official website. Cost: $15.00 plus. Depends on seating and age.